Amir Khan proved that old habits do indeed die hard as he survived a fourth-round knockdown to labour to a points victory over Julio Diaz on Saturday night. The 26-year-old was embarking on his second fight with new trainer Virgil Hunter as he attempted to rebuild his career following back-to-back defeats to Lamont Peterson and Danny Garcia. But after Carlos Molina had been dispatched with relative ease last December, this triumph brought more than a tinge of relief when the result was announced. Khan conceded he had 'little things' to work on but said he was broadly satisfied with his performance. Time and time again he had reiterated that he had ditched the gung-ho tactics that had become his trademark under previous trainer Freddie Roach. He had been in control of his unification clash with Garcia last summer before responding to a knockdown by declaring all-out war. Khan, a silver medallist at the 2004 Olympics in Athens, insisted his defence had been sharpened under the watchful eye of Hunter in San Francisco. But questions will hang long in the Sheffield night after the Bolton welterweight was pushed all the way by former world champion Diaz. Khan, who certainly made a statement in his bright orange shorts, began patiently, looking to land the jab and stick the pre-prepared game plan set out by Hunter. 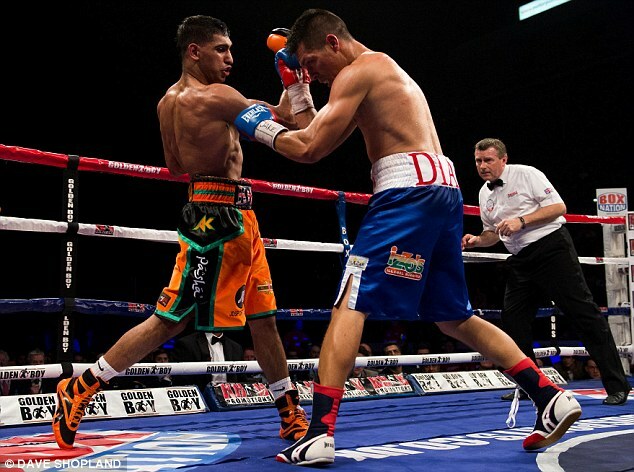 Diaz was on the back foot in the early stages as Khan's trademark fast hands had the Mexican covering up and holding. Khan's combinations were largely finding leather in the first session but a left hook-straight right routine found the target as the bell sounded. The home favourite picked up from where he left off in the second stanza and two shuddering left hooks had Diaz struggling. The visitor attempted to respond in kind but his wild attempt was easily sidestepped. Diaz had shown little invention up to this point and with Khan's hand speed a tricky proposition for the best boxers in the world, Diaz was taking sufficient punishment to fall further behind. But then disaster struck as a left hook to the head left Khan floundering on the canvas as swathes of deja vu swept the arena and intakes of breath were held longer than is natural. 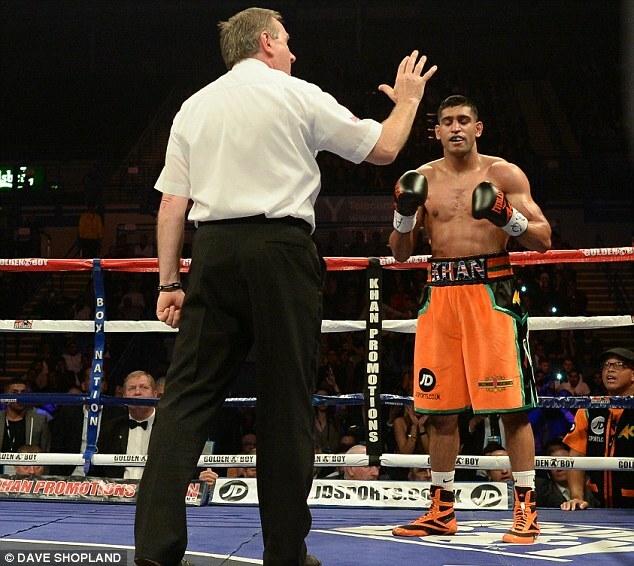 The count however was beaten and Khan was quick to retreat and stay out of Diaz's clutches. The dynamics of the fight had certainly shifted but Khan looked to have recovered well in the fifth round, landing a jab that had Diaz almost bent double. But having struck gold with one left hook, Diaz was not about to let up and each time he came close to replicating his feat, the crowd gasped with fear. As the contest entered the second half, Khan looked to revert back to his left hook-straight right combinations that were scoring points earlier in the fight. A cut then opened up at the side of Diaz's right eye and Khan took advantage, landing single shots that packed a mighty punch. By round eight, Khan looked to be streaking ahead on the cards again but the next four rounds proved uncomfortable viewing for his fans. A right hand found its target and the Brit stumbled, acknowledging the shot in the process. Under pressure, he managed to escape further punishment but shipped another left hook in the next session while being forced on to the back foot, sinking back into this boots instead of pushing forward with the jab to keep the ever-dangerous Diaz at bay. At this stage, Khan's supporters ringside were repeatedly taking to their feet with heads in hands as their man continued to concede ground and rounds. The momentum was continuing to slip away from him and too often Khan would engage, happy to trade at close quarters - something that had proven ill-advised. He emerged from his corner for the final round to a rousing reception and managed to stem the tide and ensure there would be no upset by sneaking the session. One judge agreed with me, scoring the bout 114-113 with the other two settling on 115-113 and 115-112. Khan was frank with his performance, and regarding the knockdown he said: 'I was off balance but I got back up and got my game-plan back. 'I still have little things to work on back in the gym. I give a lot of credit to Julio who came to fight - that's why he's a two-time world champion. Afterwards, Golden Boy chief executive confirmed that Khan's next bout, at the start of December, will be for a world title, either back at light-welterweight or up at the next division. 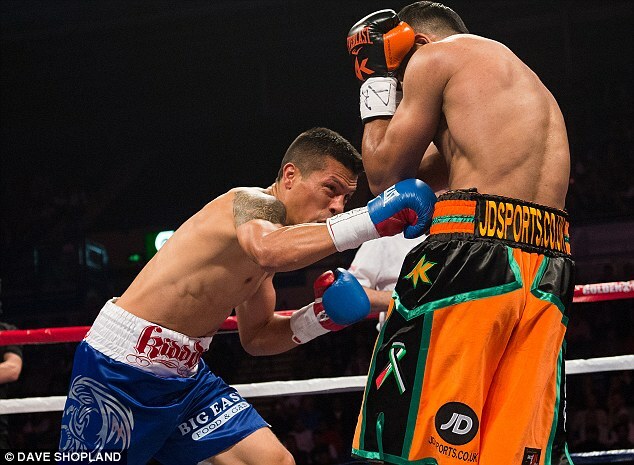 SHEFFIELD, England -- Amir Khan came back from a knockdown to unanimously outpoint fast-finishing Julio Diaz on Saturday night in a welterweight fight at Motorpoint Arena. 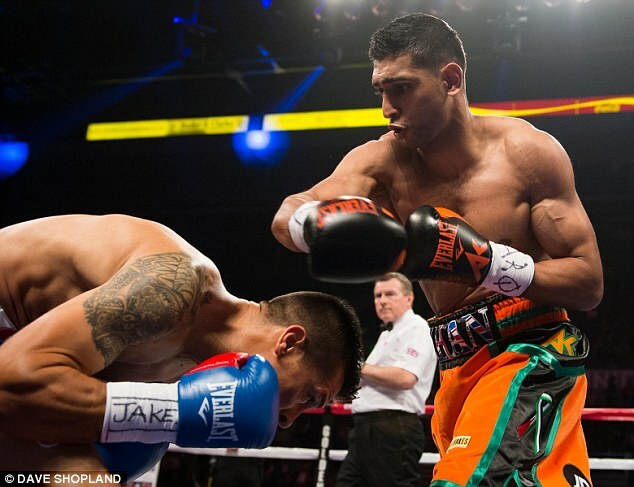 Amir Khan (left) beat Mexico's Julio Diaz in a unanimous 12-round decision in a welterweight bout. Khan, trying to rebound after consecutive losses to Lamont Peterson and Danny Garcia in the last 16 months, was cruising early against Diaz, the aging former two-time world lightweight champ. 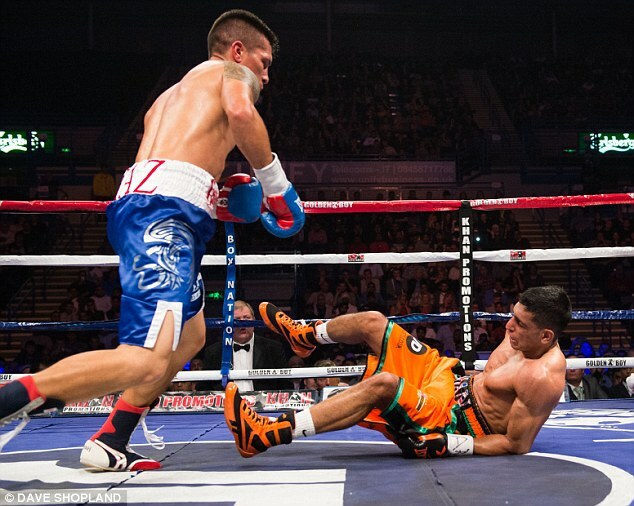 Then Diaz exposed Khan's weakness by dumping him with a left hook in the fourth round, and staggered the former world light-welter champ with hooks in the eighth, 10th and 11th rounds. 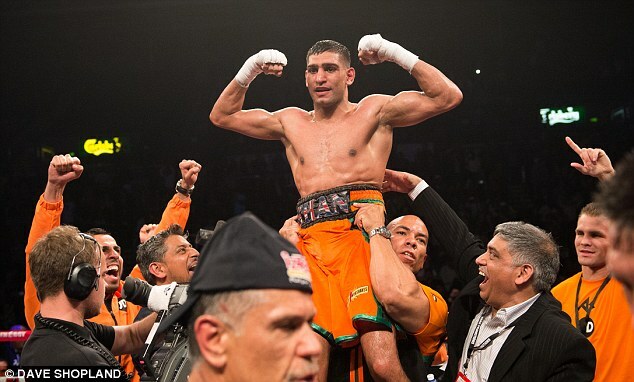 Khan (28-3, 19 KO) received winning scores of 115-113, 115-112, 114-113. On the undercard, undefeated American heavyweight Deontay Wilder stopped former Olympic champion Audley Harrison in the first round. Harrison fell in a neutral corner from the first meaningful punch of the bout, and Wilder kept flailing at him before referee Terry O'Connor stepped in and called it off after 1 minute, 10 seconds. Wilder, the 2008 Olympic bronze medalist, improved to 28-0, all by knockout. Harrison, who briefly held a minor world title nine years ago, fell to 31-7. The British fighter admitted it was likely the end of his career. "I've got to be realistic, I'm 41. It's going to be hard to get opportunities like this on the big stage again," Harrison said.